Zuikaku (Japanese: 瑞鶴 "Fortunate Crane") was a Shōkaku-class aircraft carrier of the Imperial Japanese Navy. Her complement of aircraft took part in the attack on Pearl Harbor that formally brought the United States into the Pacific War, and she fought in several of the most important naval battles of the war, finally being sunk during the Battle of Leyte Gulf off Cape Engaño is a cape and northern point of Palaui Island, an island off the northeastern most point of the island of Luzon in the Philippines. One of six carriers to participate in the Pearl Harbor attack, Zuikaku was the last of the six to be sunk in the war (four in the Battle of Midway and Shōkaku in the Battle of the Philippine Sea). In 1941, Zuikaku, under the command of Captain Yokokawa Ichibei, and her sister ship Shōkaku comprised Carrier Division 5. On 26 November 1941, she left Hittokapu Bay for the attack on Pearl Harbor as part of the Kido Butai ("Mobile Force"). Her aircraft complement consisted of 15 Mitsubishi A6M fighters, 27 Aichi D3A dive bombers, and 27 Nakajima B5N torpedo bombers. On 7 December, she launched two waves of aircraft against American military installations on the island of O'ahu. In the first wave, 25 dive bombers attacked Wheeler Army Airfield and five fighters attacked the airbase at Kaneohe. In the second wave, 27 torpedo bombers, armed with bombs, attacked the airbase at Hickam Field and 17 dive bombers targeted the battleships USS California and USS Maryland on Battleship Row at Pearl Harbor. California later sank, while Maryland escaped Pearl Harbor with moderate damage. In May 1942, she was assigned along with Shōkaku to support Operation Mo, the invasion of Port Moresby, New Guinea. Alerted by intercepted and decrypted Japanese naval messages, the Allies dispatched the carriers USS Yorktown and USS Lexington to interfere with this operation. On 8 May 1942, during the Battle of the Coral Sea, the main carrier forces located one another and launched maximum-effort raids, which passed each other in the air. Hidden by a rain squall, Zuikaku escaped detection, but Shōkaku was hit three times by bombs and was unable to launch or recover her aircraft. In return, torpedo and dive bombers from both ships hit the Lexington, which was later scuttled by torpedoes from an escorting destroyer. Zuikaku was undamaged in the battle, but sustained severe losses in aircraft and aircrew. This required her to return to Japan with her sister ship for resupply and aircrew training, and neither carrier was able to take part in the Battle of Midway in June 1942. In August 1942, commanded by Captain Tameteru Notomo, Zuikaku was dispatched as part of Carrier Division One along with the repaired Shōkaku and the light aircraft carrier Zuihō to oppose the American offensive in the Solomon Islands. On 24 August 1942, in the Battle of the Eastern Solomons, her aircraft severely damaged the carrier USS Enterprise. She was based at Truk for the next few months. On 26 October 1942, in the Battle of the Santa Cruz Islands, her aircraft again damaged the repaired Enterprise, and crippled USS Hornet (Hornet was abandoned after a failed scuttling attempt and later sunk by Japanese destroyers). However, Shōkaku and Zuihō were both severely damaged by American air attacks, and Zuikaku had to recover their surviving aircraft in addition to her own. Of the 110 aircraft launched by the three Japanese carriers, only 67 returned to Zuikaku. She then returned to the home islands via Truk for training and aircraft ferrying duties. In February 1943, she covered the evacuation of Japanese ground forces from Guadalcanal. In May, she was assigned to a mission to counterattack the American offensive in the Aleutian Islands, but this operation was cancelled after the Allied victory on Attu on 29 May 1943. Later in 1943, under the command of Captain Kikuchi Tomozo, she was again based at Truk and operated against U.S. forces in the Marshall Islands. In 1944, she was based at Singapore. In June, she was assigned to Operation A-Go, an attempt to repulse the Allied invasion of the Mariana Islands. On 19 June 1944, in the Battle of the Philippine Sea, Taihō and Shōkaku were both sunk by American submarines, leaving Zuikaku, the only survivor of Carrier Division One, to recover the Division's few remaining aircraft. On 20 June, a bomb hit started a fire in the hangar, but Zuikaku's experienced damage control teams managed to get it under control, and she was able to escape under her own power. After this battle, Zuikaku was the only survivor of the six fleet carriers that had launched the attack on Pearl Harbor. In October 1944, she was the flagship of Admiral Jisaburo Ozawa's decoy Northern Force in Operation Shō-Gō 1, the Japanese counterattack to the Allied landings on Leyte. On 24 October, as part of Third Carrier Division, she launched aircraft along with the light carriers Zuihō, Chitose, and Chiyoda in an ineffective strike against the U.S. Third Fleet. Several of these aircraft were shot down, and the majority of the surviving aircraft did not return to the carriers, instead landing at Japanese land bases on Luzon. However some of her aircraft made kamikaze attacks and helped sink USS Princeton; and most of the others were sent to other surviving carriers and air bases, to later sink the USS St. Lo (CVE-63) during the Battle of Samar after again using the new kamikaze tactics. The next day, during the Battle of Cape Engaño, she launched her few remaining aircraft for combat air patrol, search, or to join the aircraft already on Luzon. She then came under heavy air attack and was hit by seven torpedoes and nine bombs. With Zuikaku listing heavily to port, Ozawa shifted his flag to the light cruiser Ōyodo. The order to abandon ship was issued at 13:58 and the naval ensign was lowered. Zuikaku rolled over and sank stern-first at 14:14, taking the lives of Rear Admiral (promoted from captain ten days earlier) Kaizuka Takeo and 842 of the ship's crew; 862 officers and men were rescued by the destroyers Wakatsuki and Kuwa. Zuikaku cruising toward Hitokappu Bay, Iturup, in November 1941. The carrier Kaga is seen in the background. Sailors winching up the anchor on the quarter-deck of Zuikaku, 26 November 1941. Archive Japanese Naval photo showing the Japanese aircraft carrier Zuikaku at Sea Nov 1941. Photo 01: Photo #: NH 73069 Battle off Cape Engano, 25 October 1944. Crewmembers salute as the Japanese Naval Ensign is lowered on the sinking carrier Zuikaku, during the afternoon of 25 October. View looks aft from the rear of the carrier's island, with radio antenna masts folded horizontal on her starboard side. Note her sharp list to port. A 25mm single anti-aircraft machine gun is mounted on the flight deck, at the lower right. Courtesy of Mr. Kazutoshi Hando, 1970. U.S. Naval History and Heritage Command Photograph. The crew of the sinking Zuikaku salute as the flag is lowered on 25 October 1944. Banzai ! three cheers. 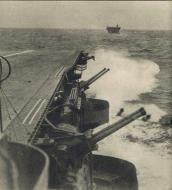 Photo 02: Photo #: NH 73070 Battle off Cape Engano, 25 October 1944. Crewmembers of the sinking carrier Zuikaku give a final "Banzi" cheer after the Japanese Naval Ensign was lowered, during the afternoon of 25 October. View looks aft from the rear of the carrier's island, with radio antenna masts folded horizontal on her starboard side. Note the sharp list to port. Courtesy of Mr. Kazutoshi Hando, 1970. U.S. Naval History and Heritage Command Photograph. Banzai ! three cheers. Photo 03: Photo #: NH 73071 Battle off Cape Engano, 25 October 1944. Crewmembers of the listing Japanese aircraft carrier Zuikaku throwing explosives over the side, after she had been damaged by U.S. carrier aircraft on 25 October. Photographed from the carrier's island, looking to port. Courtesy of Mr. Kazutoshi Hando, 1970. U.S. Naval History and Heritage Command Photograph. Japanese aircraft carrier Zuikaku (center) and two destroyers maneuvering, while under attack by U.S. Navy carrier aircraft, during the late afternoon of 20 June 1944. Zuikaku was hit by several bombs during these attacks, but survived. Official U.S. Navy Photograph, now in the collections of the National Archives. 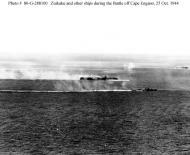 Photo 01: Photo #: 80-G-281767 Battle off Cape Engano, 25 October 1944. Japanese aircraft carriers Zuikaku (left center) and (probably) Zuiho (right) under attack by U.S. Navy dive bombers during the Battle off Cape Engano. Both ships appear to be making good speed, indicating that this photo was taken relatively early in the action. Both carriers are emitting heavy smoke. Note heavy concentration of anti-aircraft shell bursts in lower right and right, and a SB2C "Helldiver" diving in the lower left. Official U.S. Navy Photograph, now in the collections of the National Archives. Photo 01: Photo #: NH 95785 Battle off Cape Engano, 25 October 1944. Japanese aircraft carrier Zuikaku underway early in the action, while she was still capable of making good speed. Note camouflage pattern painted on her flight deck, and smoke coming from her stacks. Photographed from a U.S. Navy carrier plane. Copied in 1986 from an original print in the TG38.3 action report of 2 December 1944. U.S. Naval History and Heritage Command Photograph. 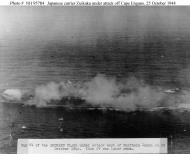 Photo 02: Photo #: NH 95545 Battle off Cape Engano, 25 October 1944. 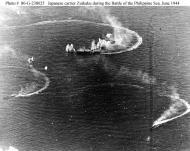 Japanese aircraft carrier Zuikaku under attack at about 1400 hrs. on 25 October, approximately at the end of the day's third attack on the Japanese force. Zuikaku appears to be listing, but is still under way. Photographed from a USS Enterprise (CV-6) plane. Copied in 1985 from an original print in the TG38.4 action report, serial 00267 of 18 November 1944. U.S. Naval History and Heritage Command Photograph. 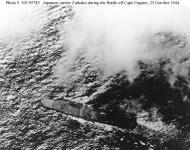 Photo 03: Photo #: NH 95784 Battle off Cape Engano, 25 October 1944. Japanese aircraft carrier Zuikaku under attack and smoking, though still under way, 25 October 1944. Photographed from a U.S. Navy carrier plane. Copied in 1986 from an original print (photo # 49) in the TG38.2 action report of 8 November 1944. U.S. Naval History and Heritage Command Photograph. 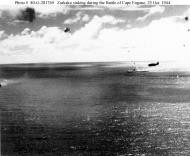 Photo 04: Photo #: 80-G-288100 Battle off Cape Engano, 25 October 1944. Japanese aircraft carrier Zuikaku and a Akizuki class destroyer underway during U.S. carrier plane attacks at about 1330 hrs. on 25 October. The light carrier Zuiho is in the right distance. This view appears to have been taken at about the same time as that seen in Photo # NH 95542. Official U.S. Navy Photograph, now in the collections of the National Archives. 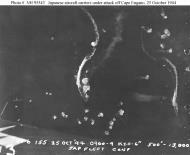 Photo 05: Photo #: 80-G-281769 Battle off Cape Engano, 25 October 1944. Japanese aircraft carrier Zuikaku listing, following several hits by attacking U.S. Navy carrier aircraft on 25 October. A U.S. Navy TBM "Avenger" torpedo plane is between the ship and the camera. Official U.S. Navy Photograph, now in the collections of the National Archives. 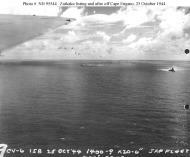 Photo 06: Photo #: NH 95544 Battle off Cape Engano, 25 October 1944. Japanese aircraft carrier Zuikaku dead in the water, listing and afire (center), at about 1400 hrs., 25 October, following the day's third attack on the Japanese force. Ship maneuvering at right is the battleship Ise. Photographed from a USS Enterprise (CV-6) plane. Copied in 1985 from an original print in the USS Enterprise report of the action. U.S. Naval History and Heritage Command Photograph. 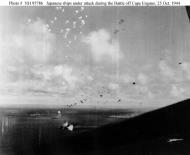 Photo 07: Photo #: 80-G-272556 Battle off Cape Engano, 25 October 1944. 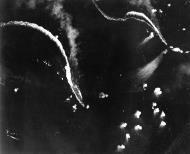 Japanese ships under attack by Task Force 38 aircraft, during the afternoon of 25 October. Carrier Zuikaku is dead in the water and smoking in the left center. Light carrier Zuiho is underway at the left, nearer to the camera. Photographed from a USS Franklin (CV-13) plane. Note anti-aircraft shell bursts overhead. Official U.S. Navy Photograph, now in the collections of the National Archives. 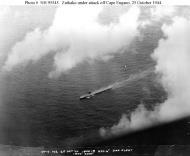 Photo 08: Photo #: NH 95786 Battle off Cape Engano, 25 October 1944 Japanese warships maneuvering under attack by U.S. Navy carrier aircraft, during the afternoon of 25 October. Bombs are falling near the light carrier Zuiho, in lower left center. The large carrier Zuikaku is burning and apparently dead in the water in the right center distance. Nearest of the two ships at left, beyond Zuiho, is an Akizuki class destroyer. Note anti-aircraft shell bursts overhead. Photographed from a USS Franklin (CV-13) plane. Copied in 1986 from an original print (photo # 26) in the TG38.4 action report of 18 November 1944. U.S. Naval History and Heritage Command Photograph. Photo 01: Photo #: NH 73068 Battle off Cape Engano, 25 October 1944. Transferring Vice Admiral Ozawa's flag from the damaged aircraft carrier Zuikaku to the light cruiser Oyodo, at about 1100 hrs. on 25 October. Photographed from the listing Zuikaku's flight deck, with Oyodo approaching from her port quarter. Courtesy of Mr. Kazutoshi Hando, 1970. U.S. Naval History and Heritage Command Photograph. Dull, Paul S. (1978). A Battle History of the Imperial Japanese Navy (1941–1945). Naval Institute Press. Hammel, Eric (1987). Guadalcanal: The Carrier Battles. Crown Publishers, Inc. ISBN 0-517-56608-7. Stille, Mark (2005). Imperial Japanese Navy Aircraft Carriers 1921–1945. Osprey Publishing. ISBN 1-84176-853-7. Beach, Edward L. Submarine, New York: Henry Holt & Co. 1946. Morison, Samuel Eliot. The Two Ocean War, Boston: Little, Brown & Co. 1963. Tully, Anthony P. IJN Shokaku: Tabular Record of Movement, Combined Fleet.com, 1998.